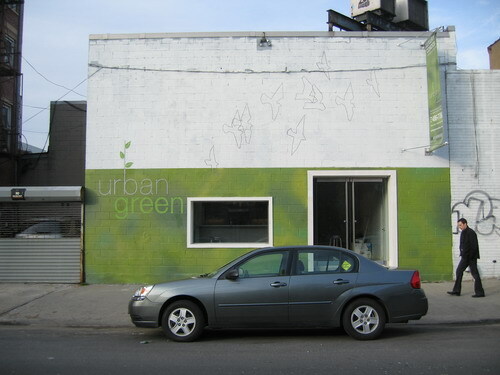 The Gowanus Lounge: Construction Site Du Jour: Urban Green Death Wins Again!!! Construction Site Du Jour: Urban Green Death Wins Again!!! For a development that's selling itself as offering suburban greenery and a "landscaped oasis," Urban Green seems to also be creating a hazard to children, pets and moronic adults with impaired judgment on North 6th Street. Why? Its gate on N. 6th is often left open wide enough for a child to stroll through and for an adult--even a big one--to squeeze through. Would it kill someone to properly close it and deprive us of one more thing about which to kvetch? So, here's our question: If so many construction sites are so poorly secured, is it safe to assume that it's legal or that the city doesn't consider enforcement of the law a priority? Will someone have to get hurt before there's a crackdown like what happened after the post-KFC/Taco Bell Rat Olympics? 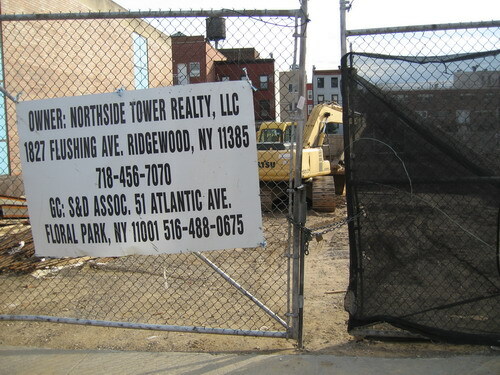 This our third time featuring the Urban Green site (you can find the other instances here and here), which saying something about both the developers and New York City's nonfeasant Department of Buildings. 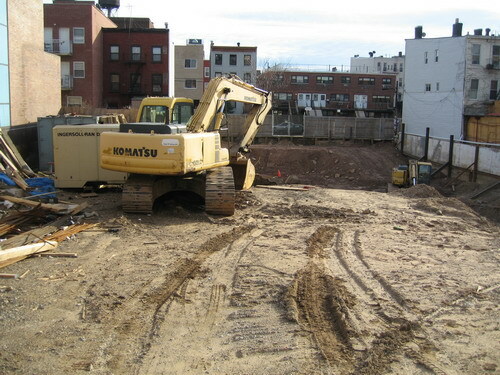 What makes the Urban Green development site particularly frightening is that anyone that wanders onto the site through the huge opening in the gate can frolic in one of the biggest construction pits in Williamsburg. Cool! Any chance they leave the keys in that big yellow "KOMATSU" thingie? That's great they leave the gates open - makes it easier to find somewhere to urinate. Seriously. And it's always interesting to see what's going on in building sites when one's too old to clamber over fences -- how many unattended children are actually walking around nowadays?